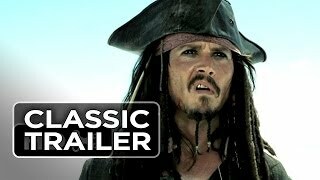 Just when he's needed most, Captain Jack Sparrow (Johnny Depp), that witty and wily charmer of a pirate, is trapped on a sea of sand in Davy Jones' Locker. In an increasingly shaky alliance, Will Turner (Orlando Bloom), Elizabeth Swann (Keira Knightley) and Captain Barbossa (Geoffrey Rush) begin a desperate quest to find and rescue him. Captain Jack's the last of the nine Pirate Lords of the Brethren Court who must come together united in one last stand to preserve the freedom-loving pirates' way of life. From exotic Singapore to World's End and beyond, from Shipwreck Island to a titanic battle, this adventure's filled with over-the-edge action, irreverent humor and seafaring myth and magic. Everything has led to this twisting, turning, wild swashbuckling ride in this final chapter of the PIRATES OF THE CARIBBEAN trilogy. This is the best pirates of the caribbean movie ever!! !